C.L. Stone’s other series (The Ghost Bird series) is so addicting that I knew I had to read her new series as soon as possible. Thief is a captivating first book in the Scarab Beetle Series, and I am positive that the subsequent books will be just as brilliant. In Thief we see the story from Kayli’s perspective. Forced by circumstance, Kayli resorts to stealing wallets in order to pay the rent so that she, her younger brother, Will, and her drunk, abusive father have a temporary roof over their heads. However, she doesn’t pickpocket from just anyone, Kayli is a thief with morals. She does not pickpocket from the elderly, women or children, even though they are the easiest targets, but only steals from those that can defend themselves. Not only that, she doesn’t take it all, she will steal a few bills and then leave the wallet somewhere she knows the correct authorities will find it and return to the owner. 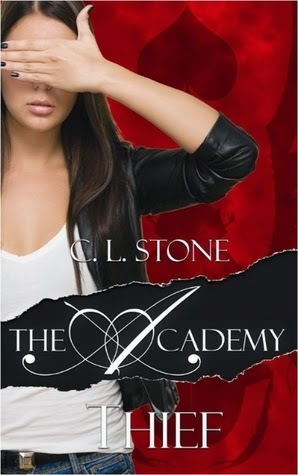 The academy boys have tracked Kayli and need her for their mission, to steal a billionaire’s wallet and then replace it at the same party without anything going missing. This billionaire has also been on the academy’s radar since he has been recently mingling with dodgy people and they want to find out what he is up to. This is an excellent start to the series and I am looking forward to the second book, which should be out this summer! A snore broke through our mutual silence. I turned my head, spotting Jack on the bed closest to the wall. Daddy, Dad, Papa and other father names never really fit well between my lips and his ears. Jack was the thing we’d settled on. And those moments he wasn’t cursing at me, he sometimes remembered my name was Kayli. There was something about him I was drawn to. He made an effort that made it impossible to hold up any wall against him. He simply climbed over it and offered to help you knock it down. Instant and overwhelming. Maybe it was best to pretend it never happened. I was a thief. I worked alone. Alone was best for me, for someone who didn’t fit in anywhere. It never hurt. It never made promises it didn’t mean. Alone was who I was. “What do you want?” Blake said. I needed to know I was wanted for who I was. And I didn’t know who I was outside of Kayli the thief.